The final shaping of the Lochaber landscape happened over the last two million years as glaciers built up and then melted back again many times. Glens and mountain corries were scooped out by the grinding glaciers to create arêtes, hanging valleys and U-shaped troughs. There are many classic examples of glacial features in Lochaber, including a distinctive ragged fjord coastline which includes deep, salt water lochs. 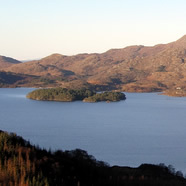 The deepest freshwater loch on Britain, Loch Morar, was scraped out by a glacier, so that its floor is considerably below sea level. During warmer interglacial periods the ice melted, causing landslides, rock falls, and transporting large volumes of sediments in melt-water rivers. A major ice sheet covered the Highlands until 22,000 years ago. Lochaber would have looked like modern-day Greenland, with only the highest mountain peaks piercing the ice. Warming was rapid but a brief return to cold conditions only 12,000 years ago led to the formation of an ice-cap 1 km thick where Fort William now stands. This could happen again! During the last 2 million years, there has been a series of cold ‘glacial’ periods interspersed with shorter warmer periods. The warmer periods usually last about 20,000 years and it’s now been 22,000 years since the last major glaciation finished! When the climate was at its coldest, ice formed large ice caps or more extensive ice sheets that covered the country. Famous evidence of ice-age activity can be found in Glens Roy, Gloy and Spean. Ice-dammed lakes once filled these glens, but as the climate warmed the ice dams burst, releasing torrents of water and leaving behind perfectly horizontal lake shore-lines carved into the sides of the glens. These ‘parallel roads’ can best be seen in Glen Roy, where there are ‘roads’ at three different levels along the flanks of the glen. The ‘roads’ led to a celebrated controversy. Charles Darwin visited them in 1838 and suggested they were ancient sea shorelines formed as Scotland rose in a series of steps, but in 1840 the Swiss glaciologist and palaeontologist, Louis Agassiz, visited them and put forward the modern interpretation. The ‘parallel roads’ played an important role in the acceptance of Agassiz’ idea that northern Europe had recently been covered in an ice-sheet.